Over 190 acres of Parkland! Enjoy the quiet tranquility of the country, and be close enough to visit the many attractions of San Diego County. The perfect location to explore the mountains, deserts, and beaches. Grouped together on the edge of Santee Lake. BBQ grills, air conditioning, flat screen TV, large front porch with patio table and chairs all included. This park is a GEM! The park is very quiet and peaceful, but so close to all that the San Diego area has to offer. Can’t wait til we come back and stay again. Very nice place. Standard back ins are huge. Nice pool and hot tub. Plenty of places to walk the dog. Less than 20 miles to San Diego and close to Miramar NAS. Wifi was pretty good. Only 6 or 7 tv channels over the air. l would love to be able to come back here again. This park was a WOW. 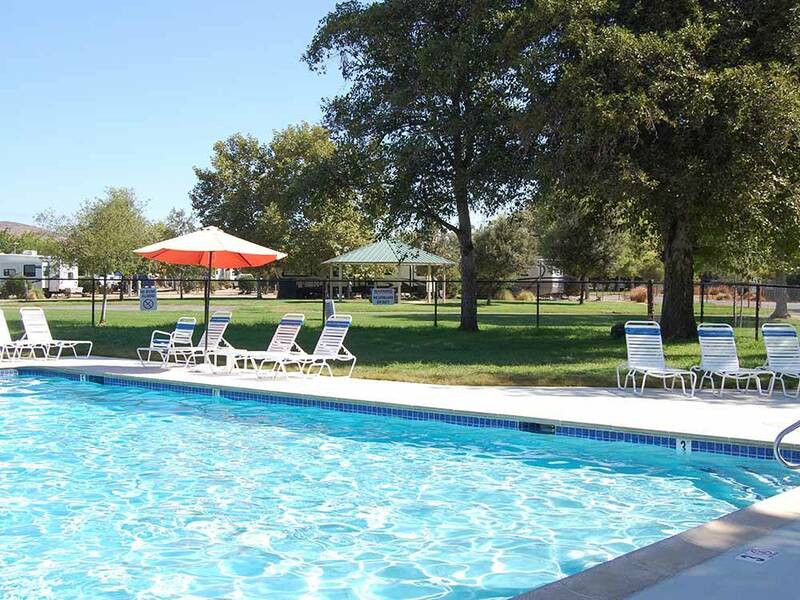 It is a beautiful park setting and the price was not bad. This is the second year we have been here late in the fall and we absolutely love this park. The check in and registration is very easy, and the staff is excellent. We really liked the spacious sites and lovely setting of the campground areas. Easy access to all the San Diego attractions and lots of choices for restaurants and supermarkets nearby. We also like that you can have campfires as long as you have a patio type fire place The park does allow up to six months stay in one site, but then you must leave for at least two weeks, so no permanent structures on any of the sites. It seems that they have improved the WiFi connectivity from a year ago and it is now fairly good. The cell phone reception in some areas of the camp sites is bad, guess the upper end of the park is in a cell tower shadow area. The rates are very good for the San Diego area and I would recommend making reservations as far in advance as possible. My wife and I have visited this campground many times. We have noticed that the same rigs are always there. Families are living there, kids going to school, etc. Take home work trucks were going back and forth. Their sites are cluttered with kids toys, bikes, BBQ's, potted plants, gazebos. Kids are practicing band instruments for school. One "camper" even had a pet pig on a leash. On our last weekday stay, I would estimate 90 percent of the park was "residents". It looks like a residential trailer park. It appears that the management wants the revenues from those folks rather than traditional campers. This is a beautiful campground, clean and lots to do. FYI, the down side is that if you want cell phone connection or internet connection, this is NOT the place for you. I work out of my RV and I MUST have internet connection. Luckily I was only there 5 nights because I could not connect to the internet and had trouble talking on my cell phone the entire time we were there due to the military base signals apparently (according to the office) blocking our signals in the park. 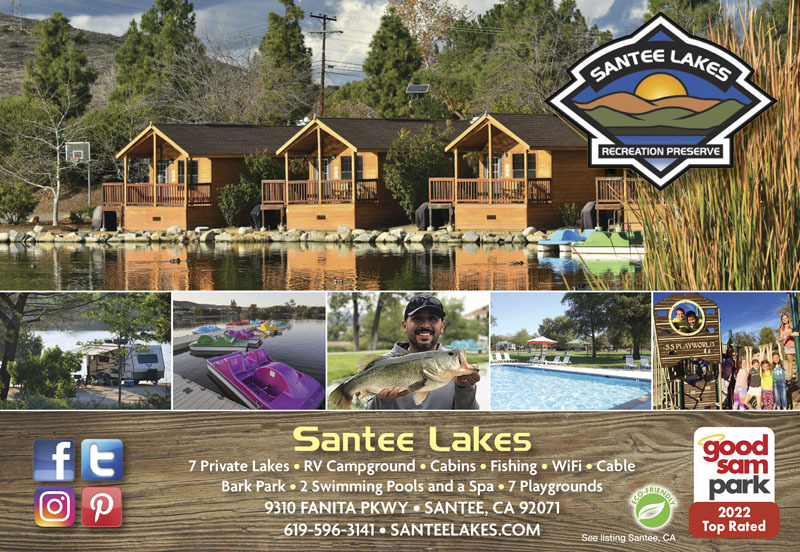 It was our first time visiting Santee Lakes and we were pleasantly surprised. It was very clean. I selected a space near the lake so the kids can go fishing. We had full hookups and there was enough space to back in our Class A. My only complaint was the store did not have a good supply of items. For example the did not have trash bags or even an extra white hose. But we all had a great time. My 3rd stay here in a pull-thru. Very convenient to Santee shopping or highways to the bay. There are also sites near the stream or lakes. Very attractive. Park hosts work to keep their amenities clean and up to date but I could never find one at their camp sites. When the coyotes along the San Diego river begin their howling it may frighten you at night or late afternoon but I saw none inside the fence. 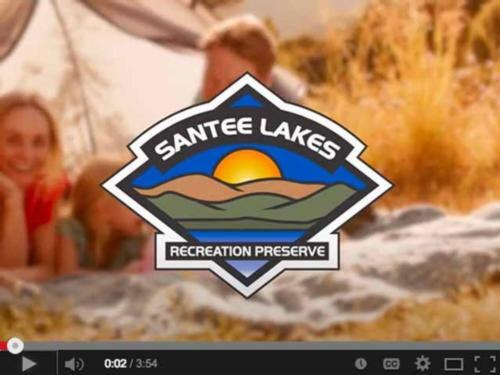 Be alert for the black and fire ants that are very active on the sites. I plan to return again and again. We have been going here for the last two years. It is great. The spaces are large enough so you have some privacy. Lots to do. Swimming, fishing, things at the community center etc. Its clean and well maintained. Prices are very reasonable.